The blue region is the expanded tiles, all units can access them normally. All units now can move 2 spaces at any direction. I’m not copying this from Shardbound or anything. Does backstab also trigger on 2 tiles behind? That could be nice for Hai. I completely forgot about backstab. Yes, backstab will trigger 2 tiles behind cause we need backstab support. Let’s do it even though I know deep inside that Duelyst will never receive any content again and it is only a matter of time before the game dies out with a whimper, a squeak, emphasizing out helplessness not only as a community but as individuals against corporations who hold our well beings in their hands. Our very livelihoods could be crushed at any moment by the all consuming capitalist machine and yet we must also acknowledge that this is a failure of humanity itself for a socialist society would do very well in the same situation. A tendency to destroy ourselves exist in every one of us, yet through the small good that exists in this world we can counter. Only when there are many us, only when we try to come together will this dormant aspect of our consciousness stir as an emergent property and begin the clock to self destruction. That is life, that is nature, but do not saddle yourselves with a sense of impending doom for all that is worth experiencing, all that is beautiful must die. Death must be accepted so that something may live on carrying the past, shouldering on into the future. Hey, look. It is my school project. that costs 9 mana… imagine how many more things you could do that would improve your chances of winning more than to get a 3/3 and make the board a little weird. 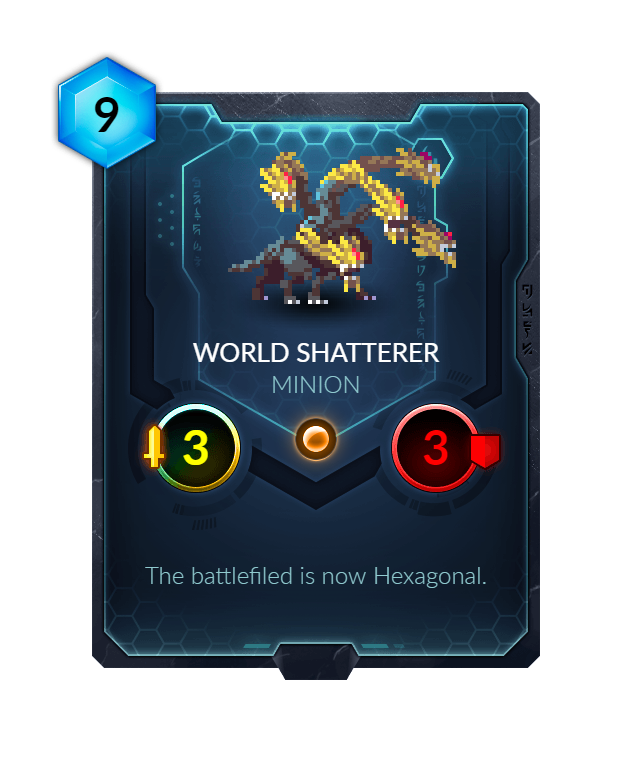 I would really like a hex based battlefield for duelyst. I appreciate that you took the time to draw this mock up screenshot.